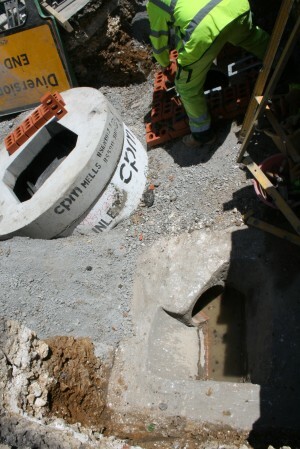 The silt trap is in and the contractors are finishing off installing the inspection chambers, building up the manhole covers to the right level and tapping back into the main surface water sewer. We hope to be completed by the weekend. This entry was posted in Uncategorized and tagged Pollution, River restoration, Silt traps, Urban runoff, Wandle on July 4, 2013 by Tim. The third Downstream Defender is in the road! Despite hitting some groundwater, progress to date has been very good (touching plenty of wood). 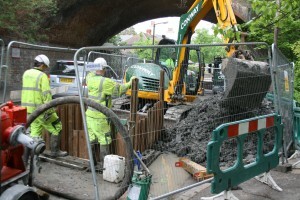 We are currently in the process of building the monitoring chambers up and downstream of the silt trap and connecting up the pipes before it will come live early next week. R.J. Dance/Emerald Construction have done a sterling job and a big thanks to them. We also have to thank the patience of all those that the works have affected, in particular the residents of Mill Pond Place who have very kindly put up with our disruption for some time now. We are now into the final leg! This entry was posted in Uncategorized and tagged Pollution, River restoration, Silt traps, Urban runoff, Wandle on June 27, 2013 by Toby. The installation of the third and final silt trap is underway on Butter Hill. Work started on Monday with R.J.Dance being the Principal Contractor. Progress to date has been great: the large surface water drain has been tapped into, a large deep hole has been excavated, and we are awaiting delivery of the chamber on Friday (21st June) morning. 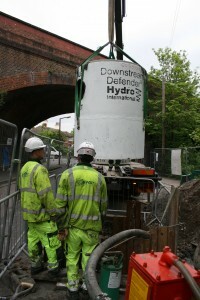 Next week will see the pipes being connected and the Downstream Defender becoming active. Exciting times!! This entry was posted in Uncategorized and tagged Pollution, River restoration, Silt traps, Urban runoff, Wandle on June 20, 2013 by Toby. The silt trap in Mill Lane is now in and functioning! 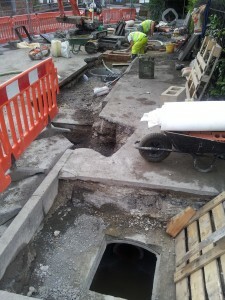 All that can be seen of it is a nice smooth patch of new tarmac and a manhole cover that will be used to clean the chamber every 6 months or so. 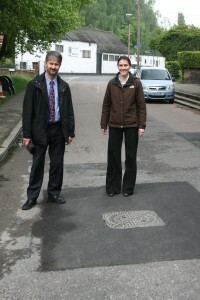 Here is a picture of Councillor Hamish Pollock checking out the site of the chamber with Wandle Trust Director Bella Davies last week. 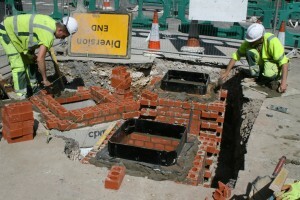 The second chamber on Denmark Road is now well under way and in fact our contractors F.M. Conway will be finished work on Thursday! In contrast to the first chamber everything has gone smoothly with no surprise pipes emerging to slow us down! 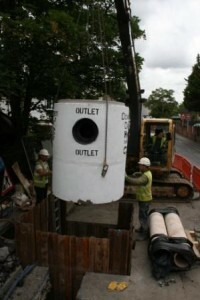 This site has an important extra addition in that we have included two monitoring chambers into the design. 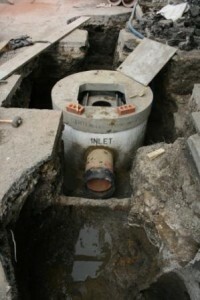 The surface water pipe first feeds into one inspection chamber then into the silt trap before passing into the second monitoring chamber and then on towards the river. 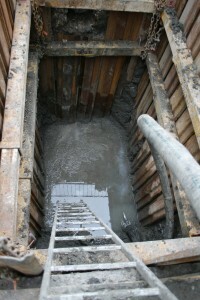 The silt trap in the ground with the surface water pipe shown in the foreground. This area of open pipe is where the upstream monitoring chamber is located. The chambers will allow us to monitor the effectiveness of the traps by taking samples before and after the silt trap. This will be carried out using automated sampling apparatus to allow analysis of the water quality and any particulates present. The access chambers (Two monitoring chambers and one for the silt trap) being built up to road height ready for the manhole covers. The third and final chamber project which will be located on Butter Hill will start on 17th June. This entry was posted in Uncategorized and tagged Pollution, River restoration, Silt traps, Urban runoff, Wandle on June 5, 2013 by Tim. After some detective work involving a number of utility companies the mystery pipe has now been identified as a redundant water main. 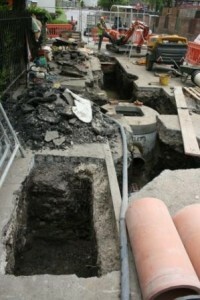 This was removed on Friday 17 May but means we are now behind schedule with the works. Currently the aim is that Mill Lane works will be complete by Friday 24 May and we will be ready to start on Denmark Road on Tuesday 28 May. 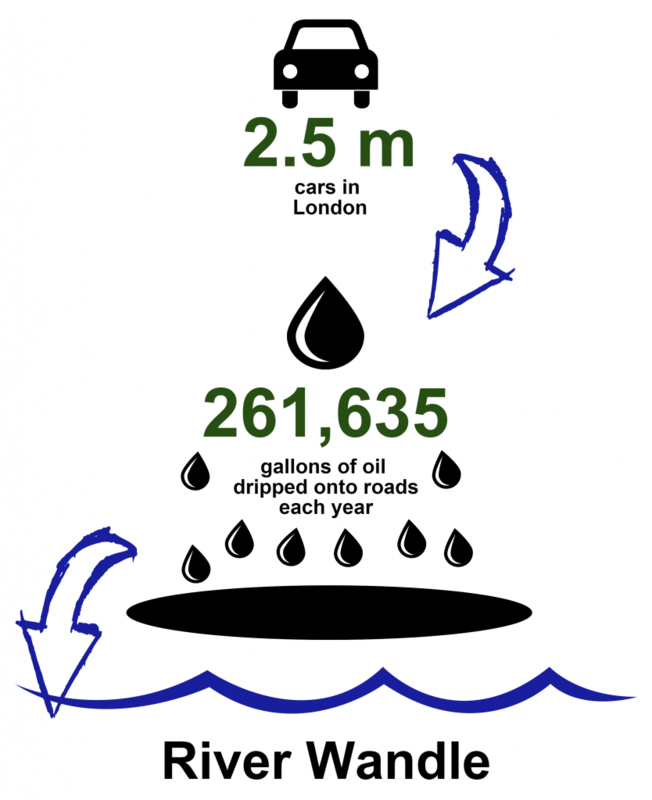 This entry was posted in Uncategorized and tagged Pollution, River restoration, Silt traps, Urban runoff, Wandle on May 17, 2013 by Tim. 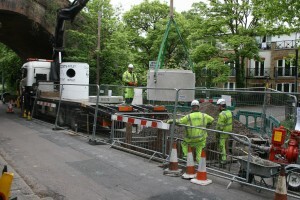 As you may have seen, work started on the silt trap project on Mill Lane, Carshalton on Monday 13 May. While digging up the road the contractors have found a gas pipe that is in a different location than was shown in the ground radar survey. This has implications for the location of the silt trap chamber and will result in some delay to the project while this is resolved. There will likely be knock on delays to the work on Denmark Road and Butter Hill as a result. We are working hard with Conways, Southern Gas and the London Borough of Sutton to minimise any potential delay or disruption. We will keep you informed as work progresses. This entry was posted in Uncategorized and tagged Pollution, River restoration, Silt traps, Urban runoff, Wandle on May 14, 2013 by Tim.